Winter is here, and with it come seasonal illnesses. I'm fighting a bad cold as I am typing this. 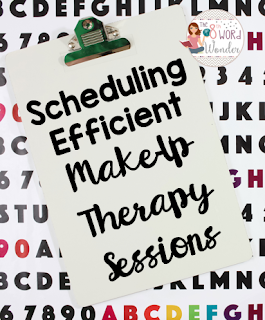 If you are anything like me, you hate missing work because it is impossible to find the time in our busy schedules to squeeze in make-up sessions. However, life happens and sometimes you just have to take a day off. 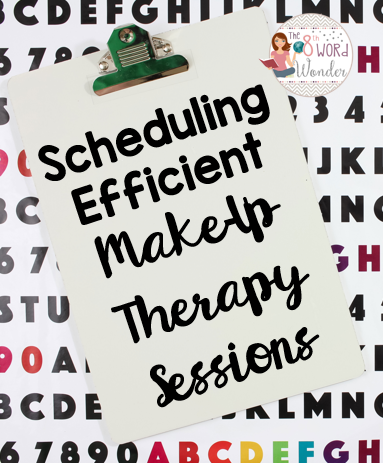 I figured I should write a post on how I try to do make-up sessions efficiently, getting as many kids seen as possible in the least amount of time while providing an adequate learning experience. Be aware that when you run large group lessons, you will need access to an adequate amount of space - make sure to reserve a spare classroom / conference room beforehand! Guess Who is a favorite! Jeopardy (see this related blog post) - I love this because it is versatile and can be adapted for artic, language, social skills, etc. Guess Who - this game can easily be adapted into a large group activity for the classroom. It targets multiple skills and is always a hit with my SDC students! Target a specific social skill - you could do a Volume lesson using the 5-point scale, read "Have You Filled a Bucket Today? ", etc. Speech stations - with large articulation groups, you can rotate the students through stations, at each of which they work independently. I am planning a blog post on activities to include at Stations, so stay tuned! These are just a few ideas to get started... by seeing students in larger groups for make-up sessions, you can save time for other important tasks and make sure everyone is getting seen. Can you think of any other great activities that lend themselves to large groups? Please leave a comment!